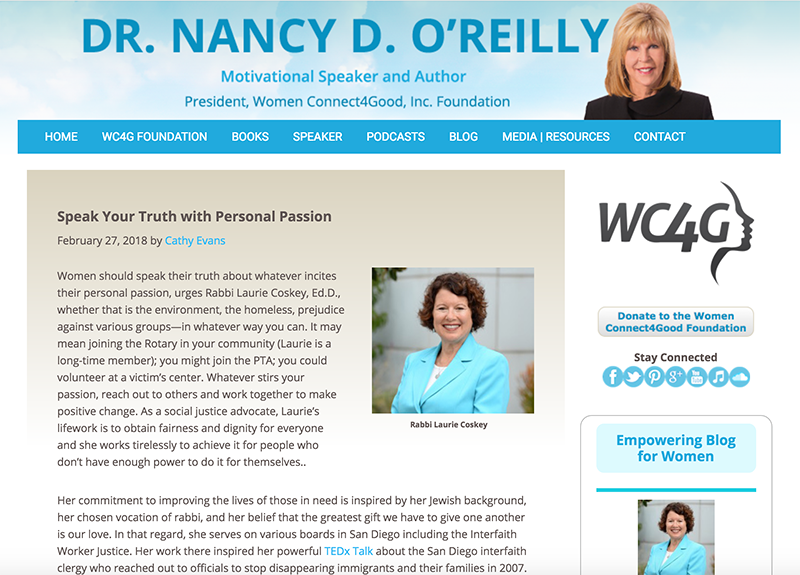 Women should speak their truth about whatever incites their personal passion, urges Rabbi Laurie Coskey, Ed.D., whether that is the environment, the homeless, prejudice against various groups—in whatever way you can. It may mean joining the Rotary in your community (Laurie is a long-time member); you might join the PTA; you could volunteer at a victim’s center. Whatever stirs your passion, reach out to others and work together to make positive change. As a social justice advocate, Laurie’s lifework is to obtain fairness and dignity for everyone and she works tirelessly to achieve it for people who don’t have enough power to do it for themselves.. Her commitment to improving the lives of those in need is inspired by her Jewish background, her chosen vocation of rabbi, and her belief that the greatest gift we have to give one another is our love. In that regard, she serves on various boards in San Diego including the Interfaith Worker Justice. Her work there inspired her powerful TEDx Talk about the San Diego interfaith clergy who reached out to officials to stop disappearing immigrants and their families in 2007. To Create Real Change, We Must Change the Systems. Laurie realized the importance of changing systems, which she chose as the subject for her doctoral study. She continues to win victories for the issues she is passionate about through negotiation and teamwork. As an advocate, she learned not to lead the people who need her advocacy, but instead to walk beside them and help amplify their voices. In this interview, she tells a heroic story about janitorial workers in office buildings organizing for better working conditions. The women who do the work are often single mothers who may speak little or no English and they work for male supervisors at night, who can control them through rewards or penalties based on sexual favors. These courageous, powerless women overcame their fear and stood up and spoke out. They do not participate in the #MeToo movement, but the activists who are helping them did appear at the Grammy Awards this year. Things are changing, Laurie says, one squeaky wheel at a time. Dr. Nancy and Rabbi Laurie share their concern that women’s perspective is often ignored. The male perspective has created our current system and to change it women must get involved. Besides getting involved in our communities, Laurie encourages women to run for public office, while admitting that it is a huge commitment to serve in elected office. Things really will not change until we make different policies, which women can do by winning elected office at their community, state or national level. She stresses that with so few women at the top of our organizations, it’s time for women not just to integrate, but to lead. That is when we will see significant change that affects everyone’s daily lives. Listen to this interview for more wonderful stories about Laurie’s life and experiences. She invites anyone who would like a personal rabbi (Jewish or not) to contact her via twitter, Facebook or Linked-In. She is happy to listen and reply. Check out this news video about Laurie’s work in San Diego for more inspiration about what a difference community involvement can make.